Whispers in the Loggia: The "Super-Nuncio"
It's never been a secret for this readership, but word's gotten out in a big way that B16's man in the States sees his mission not just as a diplomat, but as a pastor. Sure, since taking up his brief as apostolic nuncio to Washington in February 2006, Archbishop Pietro Sambi has ruffled some feathers, civil and ecclesiastical alike. Truth be told, though, they should've been ruffled long ago. For the most part, the 69 year-old prelate has touched minds and won hearts, whether moving Katrina relief workers in New Orleans to tears with his words of appreciation for their commitment to service, or thanking the organizers of one recent installation for a liturgy which, he said, enabled "the spirit of profound prayer" to fill the space. He's helped light a Hindu rangoli before holding a dialogue with Deepak Chopra and paid tribute to Wojtyla's beloved Lena Allen-Shore, a Holocaust survivor and longtime friend with whom he's shared his love of Jerusalem -- the place where, in a 2004 interview, he said he "met Jesus," who had previously been "a beautiful dream somewhere up in the sky" for him. And, of course, speaking to the nation's Catholic educators at April's NCEA Convention in Baltimore, the son and brother of teachers wowed the crowd of 10,000 with the message that they were "the greatest artists" of all. With the US bishops, whose replacements he's been plodding through with a thorough diligence, his outreach has been no less gregarious... just a bit more pointed. Sambi's talks to the American hierarchy's gatherings have made a point of identifying and focusing on the proverbial "800lb gorilla" in the room with a candor that, for a critical mass of the episcopal bench, has proven too much to take. Last year in Baltimore, he cited "the loss of credibility" in the US church following the abuse scandals and implied that an ignorance of the Scriptures contributed to the breach. On the bishops' June retreat in New Mexico, he encouraged the body to keep his "laboratory" appraised of worthy candidates to the episcopacy -- just of a better, significantly more pastoral caliber than many had been sending, lest the recommendations end up seeing nothing but the trashcan. 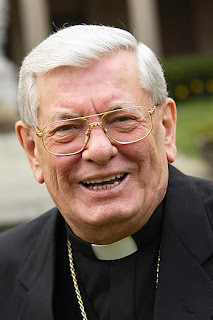 Then, at last month's Baltimore meeting, after the nuncio stunned nearly everyone in attendance by formally announcing Pope Benedict's April visit, he said that the trek's vision lay in its serving as a "new Pentecost" for Stateside Catholicism, closing his talk by telling the body that "the Holy Spirit is ready -- the answer depends on us." The Sambi Effect hasn't just been felt in church circles, but has earned the Vatican a new wave of attention and goodwill among the District's diplomatic crowd. Noting the longstanding custom that renders the Holy See's representative ex officio dean of most diplo corps given the church's history of sending the first foreign-service delegations, one ranking official -- who's taken to calling Sambi "Super-Nuncio" -- said that, while that's not automatically the case in Washington, "with all the adulation Sambi's receiving" in State circles, "he might as well be" their dean. The thought is backed up by the DC corps' insider mag, The Diplomat, which has devoted its cover profile this month to the Rimini-born papal legate... who spends his summers filling in for his hometown pastor so the latter can catch a breather. With a passion for history, he initially dreamed of life as a priest and as a professor of history. Speaking with a broad smile, Sambi is quick to say that his career in diplomacy was chosen for him. Through each of his postings as a mission-chief, one of Sambi's penchants has been advancing the concept of the nunciature as "the Pope's house." During the DC leg of Benedict's journey, that'll literally be the case. In related news, an abortion-rights advocacy group that claims affiliation with the church has reportedly sought to derail Senate confirmation of Mary Ann Glendon as the American ambassador to the Vatican.